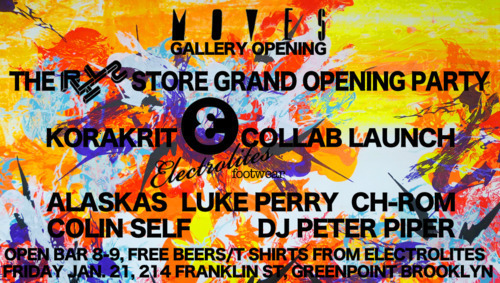 In honor of the RHLS Store / Moves Gallery Grand Opening.. we’re having a party! The party also celebrates the KORAKRIT x Electrolites Footwear Collaboration as well as the upcoming RHLS x Electrolites Footwear Collab! The RHLS Store will be the only place that you can walk into and pick up a pair of ELites, so get yourself to Brooklyn and check it out! Check out the flyer above for more info!